Last year this time, I was sitting on my in-laws’ couch trying to figure out how I was going to bring Flying Squirrel Outdoors to life. Though I officially didn’t kick it off til Jan 1, it’s hard not to think about where I’ve been this past year, ups and downs… And interestingly enough, part of what brings it home is the realization that I’ve been watching the sky regularly, every week for a year – and things are back where they started. Mercury, Jupiter and Mars — For the past couple months, there’s been a pre-dawn dance going on between the planets. Venus and Saturn have hidden in the glare of the Sun, while Jupiter and Mars are running away, higher, to the west. By the end of this week, Jupiter and Mars will be cozying up together. Before dawn, look for the dim red dot of Mars just to the right of bright Jupiter – they’ll be in close alignment by January 6, so stay tuned… Down closer to the horizon, look for surprisingly-bright Mercury to rise about an hour before the Sun. It ought to be visible, even as the horizon starts to glow, a couple finger-widths to the left (north) of bright red Antares, the star in the neck of Scorpius. Mercury is nearing its maximum elongation from the Sun, so its relative speed is fairly slow this week, hovering in about the same position night after night, even as Jupiter and Mars converge. Aldebaran and the Moon — We’ve had a few of these this year. The Moon will occult Aldebaran next Saturday evening, Dec. 30. The event is visible for almost the entire US and Canada early in the evening, and northern Europe later. Check out the timetables here for specific information on your location. The cross of Cygnus standing in the west, just after dark on Christmas Eve. Brightness is hard to capture in a 2-D image, but squint a little and the cross will pop out! First, after the Sun has set, face west. The first thing you may notice – and to some this pretty appropriate here on Christmas Eve – is the shape of a very-well-proportioned cross, standing upright on the western horizon, with its brightest star at the top. This star is Deneb, and the cross is the constellation Cygnus, the Swan. It represents a swan in flight, with its head stretched out down low, the crossbar its wings, and Deneb its tail. Not religious at all, but still, the orientation of the cross this week is pretty neat. 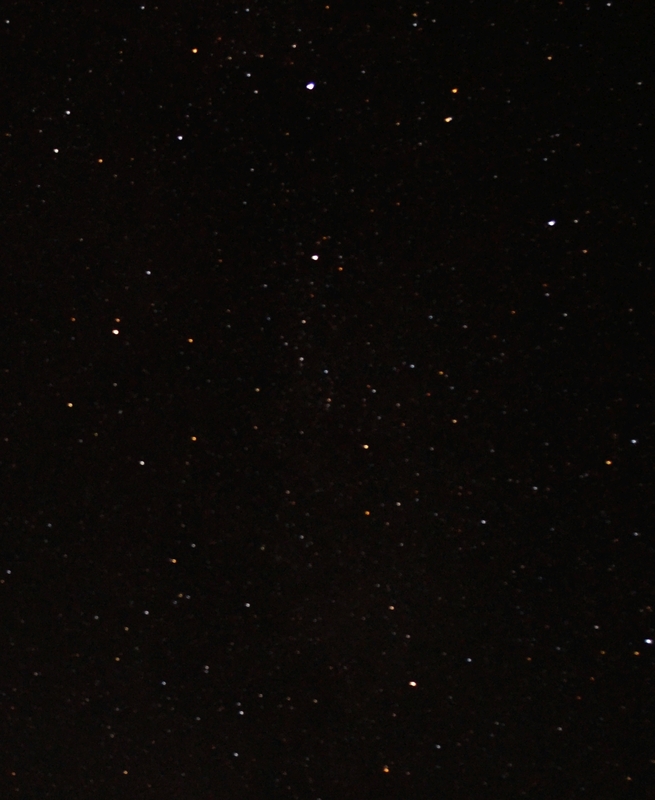 Down to the lower left of Cygnus, you’ll see bright Altair on the horizon (in the constellation Aquila). 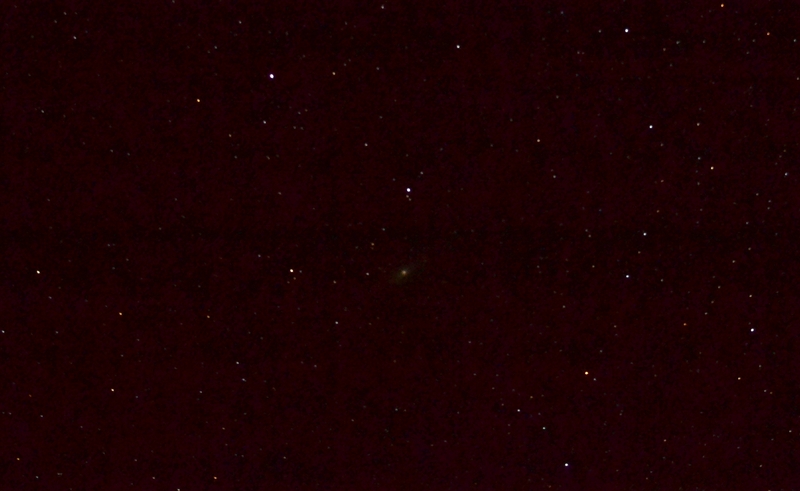 To the lower right, you’ll see bright Vega (in Lyra), also on the horizon. These three stars make the “Summer Triangle” asterism, and as you can see – that constellation is departing the sky to make room for winter stars. Now, pan right, to the north. 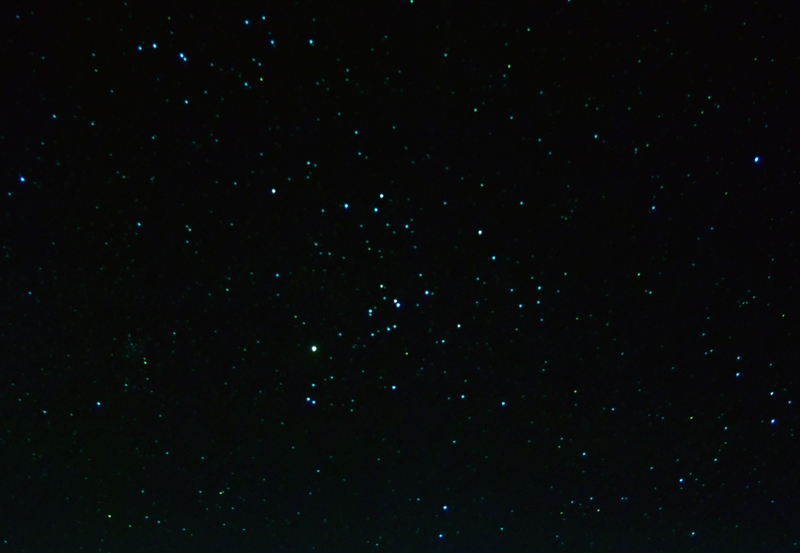 You may not even see it – but the Big Dipper asterism in Ursa Major is lying low on the horizon. The great bear is hibernating for the winter, and will rise again soon. Back to Cygnus, look up and left – you’ll see the Great Square of Pegasus. And above and to its right (almost straight up), the now-sideways “W” of Cassiopeia. Between the two, if the sky is dark enough, you might see the Andromeda Galaxy, our nearest “regular galaxy” neighbor (not counting the Magellanic Clouds in the southern hemisphere). Appearing as a faint smudge to the naked eye under dark skies, Andromeda pops in a small telescope or with binoculars. The Milky Way is not its brightest in this area, but under really dark skies you might see the ribbon of stars extending from Cygnus up through Cassiopeia. The Andromeda Galaxy, captured via long-exposure DSLR. Keep on tracing this west-east arc (you can turn around now), through Cassiopeia, and through Perseus (full of nice clusters, and looking to me like 2 arcs placed back to back, like one bowl stacked on another placed upside down on the counter), to Auriga, the Charioteer. Auriga is a rough pentagon, with bright Capella at one of its points, high in the sky. To the right (south) of Auriga, you’ll find two of the most apparent naked-eye clusters in the sky — the Pleiades (or Seven Sisters) is a tight test of clarity and vision, and the “V-shaped” Hyades below it, making up the face of Taurus the Bull, with bright Aldebaran at the lower tip. 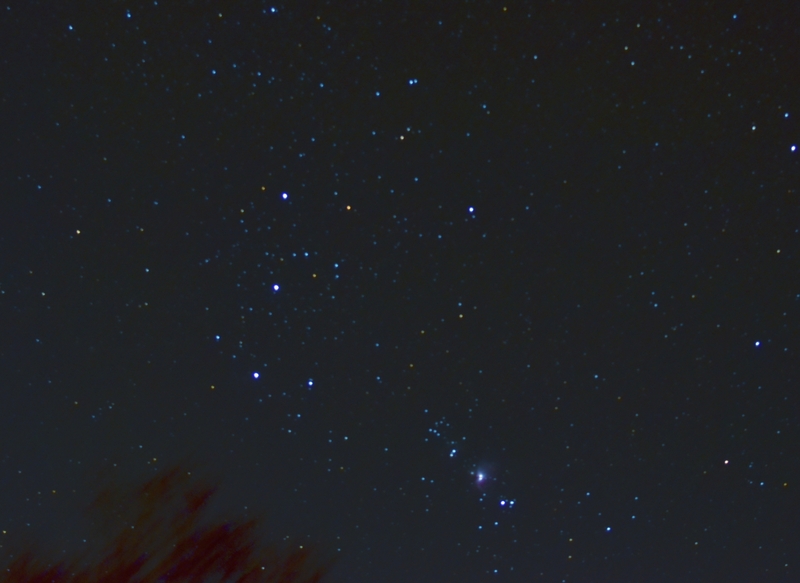 To the left (east) of Orion, the Gemini twins are lying down, with Castor and Pollux forming a short vertical line and marking the twins’ heads. Their feet point back toward Orion. Squint and you can see a pretty clear image of stick figures holding hands. Finally, look beneath Gemini to find the bright star Procyon, in otherwise unremarkable Canis Minor, the Small Dog. At about the same elevation, a couple fist-widths to the right (south), you’ll find Sirius, in Canis Major, the Large Dog, at Orion’s heels. This “Dog Star” is the brightest in our sky. Orion rising. The three near-vertical stars are his belt, and his sword, including the Great Orion Nebula, is just right of center at bottom. 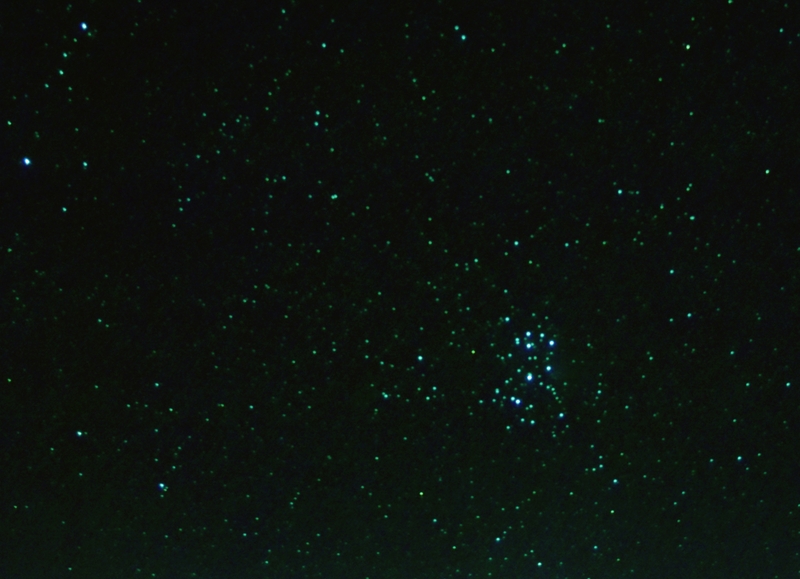 Taken with a long-exposure DSLR, no telescope. Sirius, Procyon, and Betelgeuse form a large equilateral triangle — the “Winter Triangle” coming into the night sky to join us for the next few months. Hopefully you enjoyed this brief tour, and could follow along. Learning the relative positions of the constellations like this, and learning to leapfrog from one to another, is really helpful for navigation, timing, and just keeping track. We may not NEED this knowledge these days, but if you spend any time outside at night, it sure does help! I shall be out there. Very helpful explanation, thanks. Any time! I got encouraged by one of my YouTube followers to try a video version of the astronomy segment. First one went up last night. Curious to see if I’ll be able to keep that up! Great color in those pictures. I’m jealous of your Andromeda capture – it definitely captured some of the galaxy just around the center. Nice work. Thanks, like I say that was a really tough one to get both center and arms. Wound up using very short exposures (4 seconds max) and stacking. They say thirty 4-second exposures is the same as one 120-second exposure, and so on. I suppose that makes sense, though I tried it and did not get much for the effort. Yeah, I’m not sure I buy that simple multiplication… I’m sure that stacking amplifies what you captured, but you’re still limited to what light the sensor was able to collect info those 4 seconds, just repeated. I’m no expert, but the physics of the problem feel a little more complicated than time×number of exposures.